It all started with the «Anzeiger» over 130 years ago. The founding father of the newspaper wanted to create «a connecting link between the inhabitants of the community», which is still part of the mission today. It has become increasingly important to keep in touch with the local while the world around us is growing smaller and smaller. 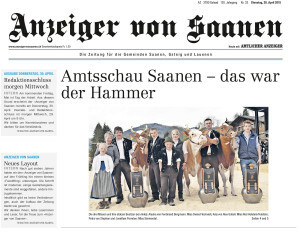 The «Anzeiger» features the latest births and cases of death, sport events, politics, culture, and economic topics that happen in and affect our region.